Every time the rain falls, it rinses clean the roofs, streets and gutters. The first inch of any rainfall has a higher concentration of pollutants than the rest, and has been called the ‘first flush’. Efforts to capture and filter these first-flush gallons help to keep rivers and lakes cleaner. Grand Rapids has no small amount of first-flush fluid, either. 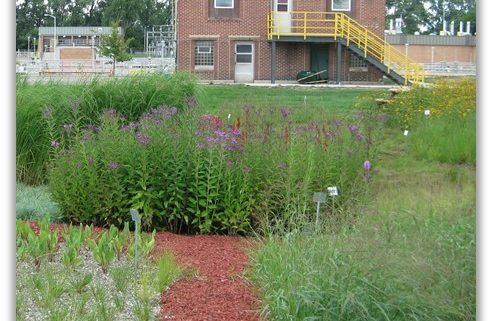 “Just some basic calculations gave us 10 billion gallons a year,” said Carrie Rivette, the Wastewater and Stormwater Maintenance Superintendent for the City of Grand Rapids. The newly approved Green Infrastructure Portfolio Standard (GIPS), the first of its kind in the country, is a plan to measure additional green infrastructure the City of Grand Rapids will construct and count toward the goal of 1 percent more stormwater infiltrated through green infrastructure every five years. That amounts to 100 million more gallons soaking into the ground through permeable pavement, bioswales and capture tanks rather than being washed into the Grand River, keeping pollutants from the yards and streets of Grand Rapids from entering the watershed. 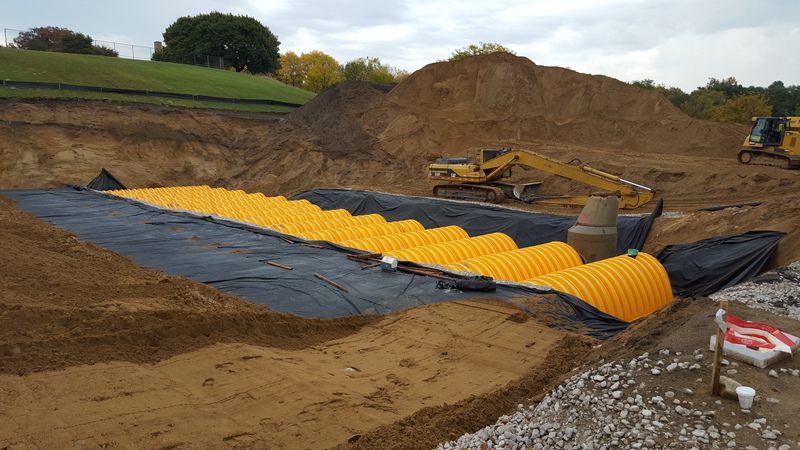 GIPS also establishes the goal of treating an additional 25 million gallons of rainwater runoff every 5 years in the form of filtering infrastructure. These benchmarks, in order to keep them reasonably attainable, were established based on the projects the City of Grand Rapids has already completed in 2015, the first year of Vital Streets work. 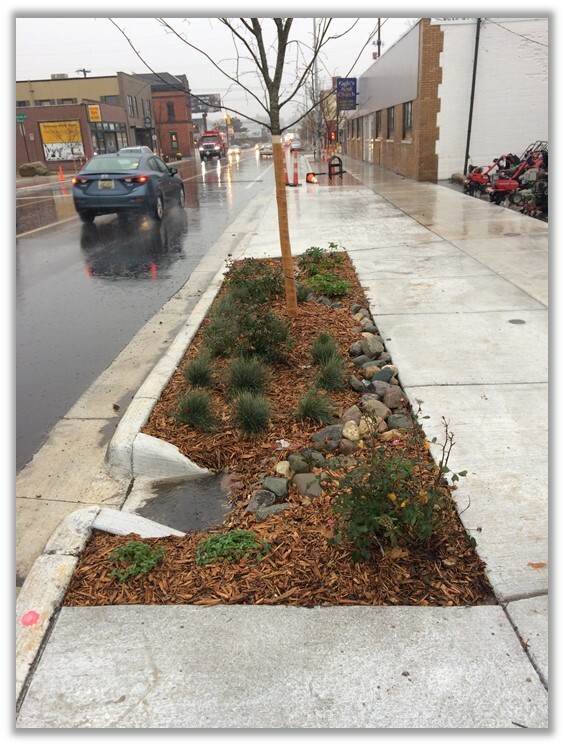 Vital Streets is a Grand Rapids initiative to improve the safety and usability of Grand Rapids streets through continued renovation, and includes standards for including green infrastructure like bioswales, tree canopy and permeable pavement. “Between the investments we’ve already got dedicated to Vital Streets and the investment that we’ve got dedicated to stormwater, this should be a goal we can reach,” Rivette said. Other projects will count toward GIPS standards include underground catch basins like those under Joe Taylor Park and Mary Waters Park. Mary Waters Park alone can hold 720,000 gallons of water until it can soak into the ground through the basin’s stone bottom. Over the course of a year, that amounts to an estimated 11.3 million gallons of first-flush water saved from entering the Grand River. Underground catch basin being constructed at Mary Waters Park. 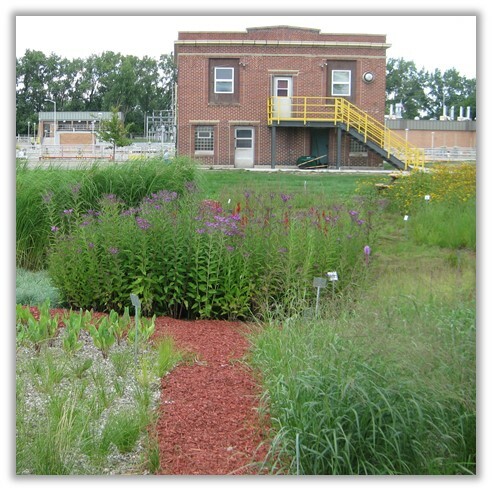 The City of Grand Rapids’ Environmental Services Department is already getting prepared to meet the next benchmark. They have a third-party study completed about where the next major project could be constructed. “Areas that are at the bottom of a hill, collect a lot of stormwater, have the proper soils, are publicly owned, so we have a list of probably seven or eight projects and then we’ll see how they line up with other capital improvement projects,” Rivette said. We have a rain barrel that collects our roof runoff to water our lawn and flowers. (During periods of heavy or protracted rain, I leave the spigot of the barrel open with a hose running out into the middle of our lawn. I would suggest that you feature plans to build rain barrels, sources to buy rain barrels, and suggestions for people/vocational programs/projects for vocational programs, etc, to make and use, sell, or donate rain barrels. Rain barrels are an excellent way to reduce runoff and provide a beneficial and free source of water for gardens and lawns. WMEAC is not currently scheduling rain barrel workshops, but you can find more information about how to construct your own rain barrel on our website at https://wmeac.org/rainbarrels/. There is also a “Frequently Asked Questions” section that can provides answers to common rain barrel-related questions. Thank you!